Stressless Skyline Signature Series Recliner with Ottoman- Medium size. Authorized Price Reduction Models- New in box. 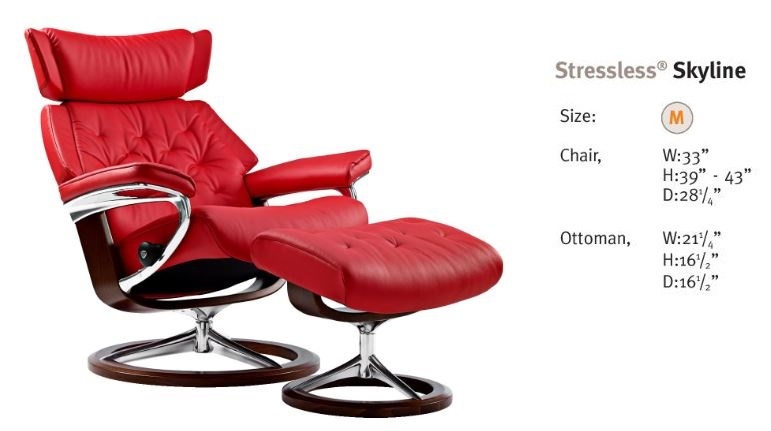 Enjoy Fast, Worry-free Delivery on a Stressless Signature Skyline Recliner with Ottoman. Start relaxing in your beautiful new Skyline Recliner fast with our Quick and Easy Shipping Methods. All of our items are backed by the rock-solid 10 year Manufacturer's Warranty at no additional cost. You can truly relax and unwind when you choose the world's most advanced recliners. From the patented technologies, to the outstanding construction and engineering, down to the incredibly useful accessories, you will be able to relieve stress and tension and promote a genuine sense of well-being in this seating solution. The Stressless Skyline (medium size) features an Ekornes Signature Base and a brand new functional technology: the BalanceAdapt-system. This brand new functionality gives you instant comfort from the moment you sit down in the chair, and makes the recliner respond to every movement you make. The end result is perfect balance. The seat cushion and the back cushion operate from a fixed angle. 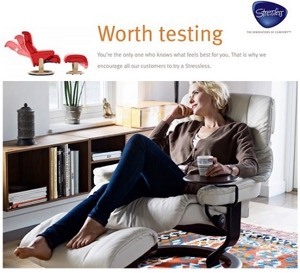 This ensures that you are support from head to toe with all the perks of Ekornes' Engineergin. The subtle and soft rocking movement increases comfort in all positions and allows you to recline the chair even further back in the sleeping position (aka sleep mode). It is pretty much guaranteed that the Skyline will impress. Take one glance and you notice some incredibly popular features that make items like the Stressless Magic and City Recliners best-sellers. The adjusting headrest allows to adjust the head support to be right at the nape of your neck, higher up on the crown of your head, or anything in between. The flared-out armrests ensure that you have a comfortable and natural positioning to your arms when seated. No longer do you sit like a frozen statue in a squared off stance. The accentuated curves to the shoulder supports provides not only an additional space for shoulder support but allows you to almost feel cradled by the supple leather and space-age foam pads. 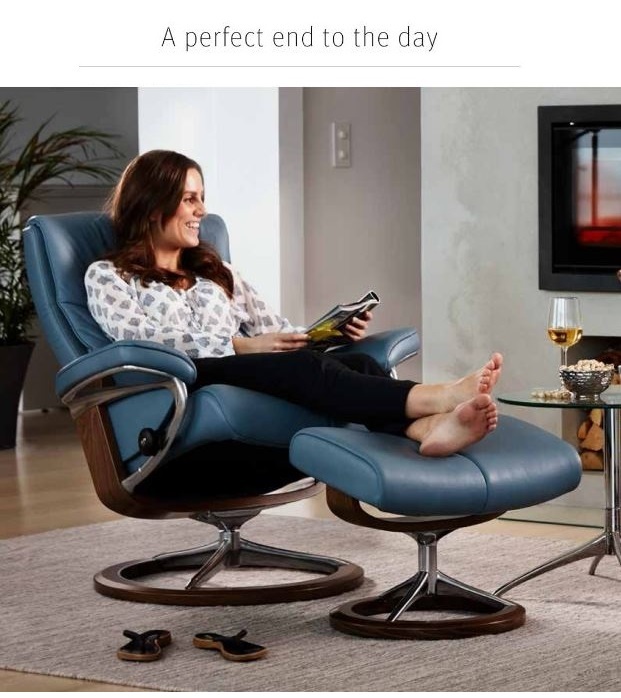 The Stressless Skyline rotates a full 360 degrees and is available with two different seat heights. The base combines the classic wood we all know and love with the polished aluminum that is oft-featured on select models like the Metro High-Back Recliners. This delivers a stunningly fresh look within the Ekornes product line. The adjustable headrest allows the seat to accomodate users of varying heights. This way you can have a seat for everyone without having to have 2 chairs. This model is going to be a winner. A low center-of-gravity enhances the optimized support for your entire body. This pushes the boundaries to a "nearly weightless sensation". The Stressless Glide Technology allows your seat to adapt to your body's movements without the use of a motor or any overly-complicated mechanics. This incredible technology uses "glide wheels" to allow your body weight to do all the work. Prefer more or less reclining tension? No problem, simply grab the glide wheel knobs and give them a twist. The Plus System™ continually provides superior support for your head, shoulders, & lower back. The engineered lumbar support moves and adjusts with your body's little movements and adjustments. The the space-friendly ottoman an ingenious Tilt System that provides premier levels of leg support to take you all the way to the ultimate in comfort. You can't help but notice the extra thick layer of cushioning on the Stressless City recliner ottoman. The ottoman also doubles as a soft, separate stool by flipping it upside down and locking the 4 plastic clips. With this much padding on the ottoman, it really does a great job as an independent stool. Stressless Recliner Accessories as well as the Ottomans & Tables are designed to match harmoniously and to last a lifetime. The manufacturer provides a 10 year Warranty at no cost because they are so confident in the quality of the products. There is a specific size match and seating style for almost everyone - Almost all recliners are available in 2 sizes (medium and large) and some are available in 3 (small, medium or large). The sofas are available in two sizes (medium or large). With dimensions like this you might notice the biggest differences between the two models are the Comfort Zone layout and that brand-new BalanceAdapt technology that allows a gentle rocking motion. However, you can have both in your favorite Ekornes Leathers or Fabrics. Give us a call at 888-486-9463 for more details. The Comfort Test™ - primarily consists of probing questions you should ask yourself to make certain a recliner is the "perfect fit" for you. Does the chair feel tall enough and wide enough to support your whole body? If your chair is too small for you, you might feel your shoulders are not properly supported by the back cushion. If your head is too far above the back cushion it will not be adequately supported. These are indicators this chair is too small for you. Try going up a size; e.g. from the Medium to the Large version. However, if the chair is too large, you may notice there is too much space between your legs and the armrests. Also, if your head feels "pushed forward" this may indicate that the chair is too large for you. Maybe you would prefer one of the exquisite fabric upholsteries offered by Ekornes over the leather options. If this is the case, the options are nearly limitless. There are 6 different fabric grades and 64 different colors. Your fabric options are: Stella, Ocean, Luna, Verona, Siena, and Dinamica. The Dinamica is the most exclusive and costs a little bit more than the other fabrics. It is usually equal in price to Batick Leather. Check out our color palettes below to see some of the available colors in each fabric. If you would like to learn more details about each fabric individually, check out our Ekornes Fabric Page. Or call 888-486-9463 to speak to our knowledgeable Customer Support Team Members. They can give you a personalized description of each of these fabrics. Ekornes provides cleaning products for the fabric as well as leather upholstery options. Click one of these links to be taken to the product pages within our website: Fabric Cleaning Kit or Leather Cleaning Kit. Also, it's important to note that 5 of 6 of these fabrics are available at a lower price than the Leather options for Stressless and Ekornes Furniture. The Dinamica Option is equal in pricing to the Batick Leather on most models. It is no wonder that Ekornes Skyline Recliners are Exclusively Endorsed by the American Chiropractic Association (the ACA). Come visit the Unwind Back & Body Store to experience the limitless styles and comfort levels for yourself. If you have already decided and are ready to order, simply order here securely or call (888) 486-9463 to speak with one of our Customer Service Representatives. We will ship your chair fully-assembled and fast to most parts of North America. Please review our return policy prior to ordering or call 888-486-9463 for personal assistance. You may also email stressless@unwind.com anytime- 24 hours, 7 days a week.